I'm a 66 year old (as of 10/18) single male. Retired from a 49 year construction career and getting into driving because I've always been interested in professional driving and seeing the country. Kyle, I remember all the paperwork on the first day. I almost ran out of signatures by the end of the day! If I did it again, I'd get a rubber stamp made up in advance. Schneider has a great program. Tough but fair. The more homework you do, the better you will do in class. So, be ready for some long days of educational activity. Go get em! Surgery Tomorrow. (Positive thoughts and prayers appreciated). Marc, best wishes for the best outcome! Got my cdl in late February, but haven't used it yet....Is that bad? Hi Greg! You will get a good answer to that from the more experienced drivers, but I think you just explain it when you get talking to recruiters. That’s not a long time so I doubt it will be a problem but don’t let too much more time go by. I think other things are of much greater concern to employers, like driving record, employment history, etc. Thanks, Rick for the info. I’m not upset with this new development, but I would like to work on “disqualifying” myself from it’s use. Has anybody on the forum been able to stop using the machine after re-testing? I had my sleep test last night and of course I was told it was positive. I’m supposed to go out on the road tomorrow morning but I had to agree to buy their $1400 CPAP machine before I’d be allowed to drive. Is that a reasonable cost for a machine? Or is this a racket ? And how does a driver get approved to stop using the machine if he gets his BMI down, etc.? Finally got my CDL license! That’s great news, Octavio! Do you have a company to drive for yet? Keep us posted as you move forward. I talked to one yard driver who had been OTR for 26 years. He had 3 heart attacks and couldn’t get a DOT med card anymore, so he drove a yard truck. Maybe this is a common scenario for yard drivers. Army, I’ve never seen anything like that before. I wonder what the deal is ? I’ve generally found yard drivers to be friendly and helpful, but I seldom have to interact with them. Some of them seem to have a chip on their shoulder, but if I approach them with a friendly and respectful attitude, most are good guys just trying to make a living like anybody else. They get a bad rap, I think, because a few are in need of an etiquette course from Emily Post, but I think they are better than remote controlled yard trucks. Scott, there is little or no difference between going to a private CDL course and signing a company contract. If you go private and then sign on with a company offering tuition reimbursement, they will stretch out those payments to the equivalent length of a contract. So, six of one, half dozen of another. Besides, what is the average length of a contract? One year? Any driver should stay with his first company a year at least. My point is that I think the contract issue is really a moot point. PE, I’m in my first year of driving and I can testify to everything Brett and the others advised you. I am on target to bring home 40,000 this year which will translate to a gross of 50,000 to 60,000 in my first year. So you have to determine if that amount of money will pay your bills. As far as staying busy, there are no worries. I always have a new preassignment as soon (or before) I have finished my active one. The company wants to keep me moving because that’s how they make money. They like to see that you are 1) a safe driver 2) an on time driver 3) a driver who follows company policy and has a positive attitude. If you can accomplish these things, the money will follow. Also, I expect I will make 10,000 more my second year, based on company policy for raises and bonuses. Not too shabby! G-Town, that makes sense . Next time it happens I’ll do what you suggested. Fortunately it’s not very often. I remember the first time it happened to me. I thought it was the end of the world. Typical rookie reaction any time something goes wrong for the first time. PS: no company cares about your permit test. Just bone up on what you now know you need to study, take the test again and move forward. Whoa there pardner. When I took the High Road CDL Program, I also got a Wisconsin State Motor Vehicle manual and studied it in addition. Doesn’t Texas have a similar manual? If they do and you didn’t study it, that’s on you pardner. John, I hope you like changing careers to driving as much as I have. Of course, you are just a kid compared to me. Follow through on the advice Old School gave you. I went through the entire High Road CDLTraining course and literally aced the permit test. There is nothing comparable on the web. Good luck and stick around! Brian, I treat blind side backs just the same as driver side backs. But I do about twice as many GOALs. This is one of those feel good success threads on TT. 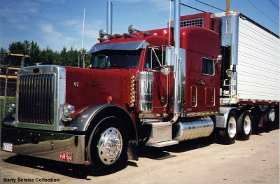 Of course, I don’t have a KW, just a lowly Frightliner. The only button we have is the ejection seat button. I’ve been tempted to use it many times.